With summer just around the corner let's talk about our skin. The good, the bad and the ugly! I prefer to be an all-natural gal. I don't like my foods or my beauty products to have a long list of ingredients that I can't pronounce. Recently I have come across one of the best beauty secrets - coconut oil. Guess what's in coconut oil? Coconut oil. Yep, that's it. ONE ingredient! Coconut oil works wonders for the body. Not only internally but externally as well. Here are some tips on how to include coconut oil in your daily beauty routine. Six great beauty tips for coconut oil. Cleanse away the day’s build-up of dirt and pollution by massaging coconut oil into your skin and gently removing the oil that has lifted the dirt away with a splash of warm water. Coconut is anti-bacterial and anti-microbial, so it is perfect for protecting and enhancing the skin’s natural flora. Take an 30 minutes and pamper yourself. Run a warm bath with a tablespoon of coconut oil in the bath water. Massage coconut oil into damp hair to help strengthen your locks and add luster. Wrap a warm wet towel around it. Leave for twenty minutes and shampoo as normal. Pop your feet into a warm footbath laced with three tablespoons of coconut oil. Add some mixed spice and coconut milk to enrich this rejuvenating foot soak. The lauric acid in coconut oil may assist with fighting fungal infections, and bring balance to your hard working feet. My personal favorite: Rich in moisturizing fatty acids, coconut oil makes a superb moisturizer, plus you’ll smell delicious too. Massage it into your whole body and don’t forget your décolletage for a balmy evening out – to add a gorgeous glisten to your skin. To enhance the glow add some sparkling mica to your oil mix. Babies love to be massaged with coconut oil. Highly moisturizing with both anti-bacterial and protective properties, take some precious time out with your little one and coat them in this nourishing oil. Is your skin feeling a little parched and flaky? 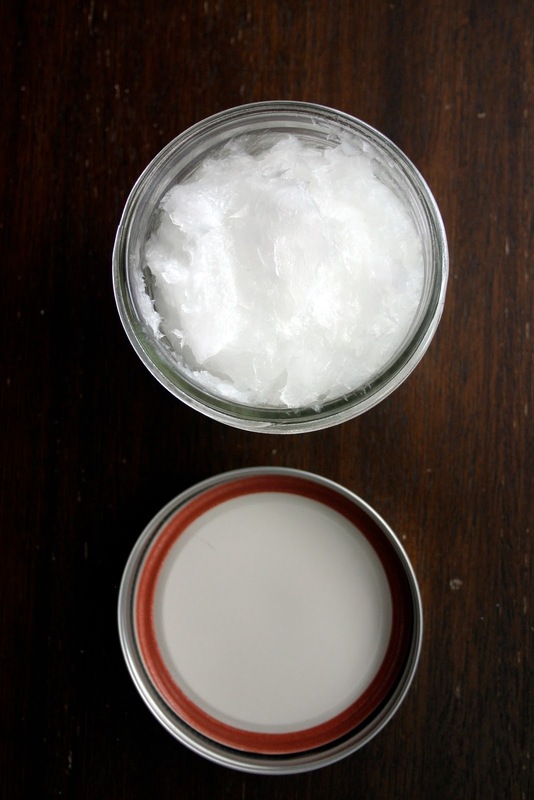 Add some sea salt or sugar to your coconut oil and use it as a scrub for the body. Your skin will feel rejuvenated, soft and glowing within minutes. I read an article online recently that stated Miranda Kerr, the supermodel for Victoria's Secret, uses this stuff on a daily basis. I don't look like her yet. Time will tell... All in all, this stuff smells fantastic! I feel like an island girl. I use it on my lips, my face, my body, my hair, my underarms. Yep, I have stopped using deodorant. My skin is clearing up and it's bringing all of my deep acne and Perioral Dermatitis bumps out. You see, coconut oil draws all of the impurities out of your body. So, be prepared. The first week your face will look worse as it draws all of the deep oils and toxins out of your skin but after that you're good to go! I was diagnosed last year with Perioral Dermatitis (P.O.). My skin was breaking out around my mouth and nose and I was cursing the Gods for giving me adult acne. However, I noticed there were other symptoms that weren't acne related. The breakouts were very itchy and it would burn. At the risk of sounding shallow, they were also very ugly. As in, red, pustule, yellow bumps. There were days I wouldn't even leave the house because it was so bad. In public I would hold my hand up around my mouth area in an effort to cover it up so it wasn't so obvious. It was depressing. I was depressed. In a large part I was depressed because I felt very shallow. I wasn't going to die. I didn't have a serious life debilitating disease. I'm sure that whatever it was was completely treatable. My dear mama suggested I put cortisone cream on it. My mom swears by this stuff. Growing up if we had a scratch, wound, bug bite, itches, you name it she had the cortisone cream at the ready. Even today, there's a tube of it in her car, in her bathroom drawer, her kitchen drawer, on her nightstand, her end-table by her chair. I'll bet she has a tube of it in her pocket right now. Why not. Let's give it a shot and see what happens. A few days later... My skin is clearing up! Hallelujah! This stuff is the miracle cream. A few days later.... Uh oh! It's breaking out again and it's worse! Time to call the dermatologist. The dermatologist immediately knew what it was that I was suffering from and prescribed a topical and antibiotic. That was it. She diagnosed me, gave me my prescription and sent me out the door. No hello, goodbye. In and out and that was that. Hmmm, what in the hell is P.O.? Guess I will have to research this on my own. The word ‘Perioral’ means ‘around the mouth’ while Dermatitis stands for ‘inflammation of the skin’. It is actually an inflammation of the facial skin due to the development of small eruptions around the mouth. It is commonly seen in young women. But it sometimes also affects men. In this condition, you can see papules or tiny red bumps around the lips. There is a burning sensation in the reddened area. The rashes may appear on the cheeks, the skin beside the nose and lips, the chin or the region just below the nose. Rashes may also appear around the forehead and eyes. 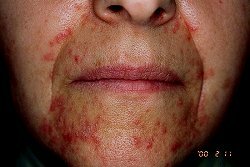 90% of Perioral Dermatitis sufferers are found to be women. Women between 20 to 45 years are susceptible to the condition. 1% of women population is thought to have suffered from the disease sometime or other in their life. 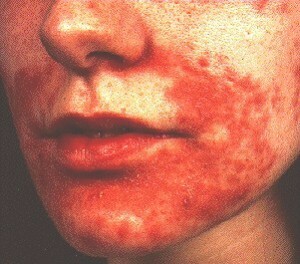 The skin of the affected facial area becomes red or often pink. The patient seems to have rashes in the affected facial region. These rashes are often lumpy and cause pain. Some people also have painless rashes. Some patients complain of an itchy feeling or mild burning sensation in the region. The skin around the mouth becomes dry. It also looks flaky in some people. In some people, there is a tense feeling in the affected skin area. In a few cases, the outer skin of the region comes out like scales. Face ointments and creams containing steroids are believed to be a trigger for this disease. Some ingredients in cosmetic products are supposed to be harmful for the skin. These are held responsible for Perioral Dermatitis. Steroid in face creams are thought to cause this disease. UV (ultraviolet) rays are also thought to give rise to this problem. Fluorinated toothpaste is also considered a factor behind the sickness. Hormonal changes can also trigger this condition. Many experts also consider oral contraceptive pills to be a reason behind this illness. 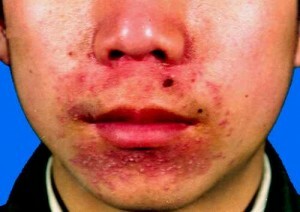 The diagnosis of Perioral Dermatitis depends on the appearance of the skin. Doctors observe the skin carefully. A bacterial test is conducted on the skin to make sure there is no scope for infection. No other medical examination is usually carried out. 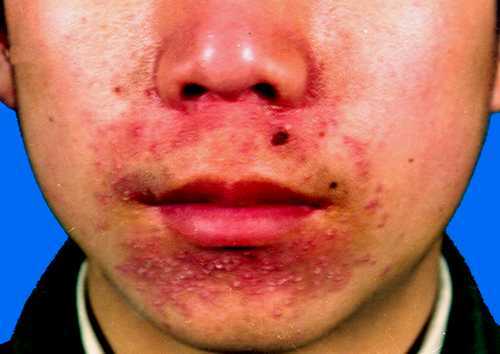 The treatment for Perioral Dermatitis is similar to the method applied in curing Acne Vulgaris. The only difference lies in the non-use of topical steroids. Only those skin creams are used that do not contain steroids. These include ointments like erythromycin, metronidazole, tacrolimus and pimecrolimus. These provide fast relief to the skin and are applied regularly for many months to prevent recurrence of the disorder. If patients are found to use steroidal creams and lotions, they are discontinued. Wash the affected skin area with warm water. Apply a soap substitute over this. Minimize the use of cosmetics and moisturizers. If possible, you should stop using these creams till your symptoms reduce. Stop using toothpastes that contain anti-tartar ingredients and fluoride until the rashes disappear. To prevent Perioral Dermatitis toothpaste change can work well along with medications. Children are often seen to suffer from Perioral Dermatitis. In children, the disease is caused by a number of factors like cosmetics, drugs and many other physical factors. Doctors normally use anti-inflammatory agents to cure the disease. In severe cases, this is treated by anti-acne medicines. It is often a problem to understand this disorder. Here are some pictures that will help you know this disease more clearly. Go through them and have a visual realization of the disorder. 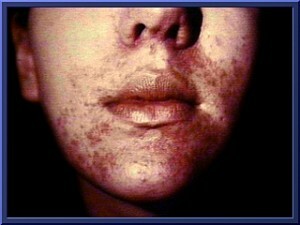 Perioral Dermatitis is not a very serious disease. It does not pose any risk to your life. However, it can be very painful in some cases. In worse cases, the condition may disfigure your face and surgical or laser treatment may be required. Such treatments can be expensive also painful in some cases. It is better to treat the condition in its initial stages before it can complicate your life and leave a scar on your face. So, note to self. Use antibiotics and the topical cream until they are gone, rinse face with warm water - no soap, stay away from makeup and especially stay away from cortisone cream. Within about a month or two it was pretty well cleared up and I felt normal again. I went to Whole Foods and bought some all natural cleansers for my face and I assumed that was the end of that and I could go about my normal routine. Spring 2012 arrived and my all-natural cleansers were all used up and I decided to go ahead and be frugal and use up my old cleansers rather than tossing them in the trash. Also, being as I am 37, I thought it was time I start using a moisturizer on a daily basis. As you have probably guessed my skin didn't quite agree with me and here we go with round two of another breakout of P.O.. Oh joy! Let's do some more research. I found information about Sodium Lauryl Sulfate (SLS) being the culprit for P.O. outbreaks. Let's take a look at my shampoo bottle. Oh look, SLS. My conditioner - SLS. My body soap - SLS. My toothpaste - SLS and fluoride. My facial soap - SLS. Time to hit my local Nutrition Stop up and stock up on my all-natural beauty products that do not contain the awful SLS. What are some natural treatments for P.O.? Unrefined Extra Virgin Organic Coconut Oil for treatment of P.O. and bonus, acne. Coconut Oil is the source of two of the most powerful anti microbial agents found in any food substances. These are Capric Acid and Lauric Acid. They are the same acids that are found in mother’s milk and keep the baby protected from infections. When these are applied on skin, some microbes (good ones) present on skin convert these acids into Monocaprin and Monolaurin respectively, thereby replacing the protective acid layer on the skin. So, no microbial infection and no Acne! Not only external application, but internal consumption of coconut oil will give you the same protection, this time internally. Finally, Coconut Oil is soothing on skin and highly penetrating. So, when applied on skin, it is absorbed readily and cuts down inflammation due to Acne to a great extent. It also helps heal any sort of wound on skin due to aggravated cases of Acne. And above all, Coconut Oil improves the rate of metabolism. This also indirectly affects proper secretion and balance of hormones and thus curbs out chances of Acne. Looks like mom's cortisone cream has some competition!! I use coconut oil every day on my skin. I believe I read some where it's the only oil that your body will actually absorb! I love it and really it the scent isn't that strong. Thanks for sharing all this great information! thank you so much! I have been fighting pd for 6+ years. first 2 outbreaks I took doxycycline for like over a month each time. then next outbreak I was nursing my first son so washed my face with apple cider vinegar several times a day. that finally started to work. next outbreak I was still nursing but the vinegar didn't seem to be helping so I was prescribed erythromycin topically. that worked that time but the next outbreak it didn't do anything when I was at end of pregnancy with my second son. I just lived with it for awhile. too busy to try anything else or make dermatologist appt with a newborn and toddler. then I read your blog. coconut oil started working immediately! amazing! if my pd comes back again, which I'm sure it will, I hope coconut oil will do the trick! thanks again!!! I am 52,Female from India and diagnosed in January with Perioral Dermatitis.I have undergone a series of tests which all came out clear-including complete allergic profile. Some days are good and some bad. Just doing trial and error to what I should eat and use.I changed my Gel toothpaste a few months ago. Was under medication including antibiotics for about 4 months. Will try Coconut oil as it is freely available at all shops and routinely used in India on scalp and hair. Note: All my life I have had no acne not even a pimple. I really hope this works for you as it has worked for me. I'll be posting more information on beauty products that have been helping me next week. Stay tuned! Dee, I know exactly what you went through with the PO! I had it a couple of years ago and did not have fun. The topical antibiotic actually made mine worse! I used it once and the next morning my face was swollen and that rash had become open sores. It was horrible!!!! I didn't want to leave the house. The oral antibiotics finally kicked in but had to be on them for several months. UGH! I certainly hope you are doing better and that it never happens to you again!!! I did narrow the cause down to Crest's ProHeath toothpaste. It started right after I bought a tube of that for the first time! If I get it again, I'm reaching for some coconut oil, so THANKS for the information!!! mjskit--I'm 55 and came down with PO for the first time in my life two months ago. Just like you--the topical antibiotic quickly caused chipmunk cheeks AND I had recently started using the same toothpaste! Antibiotic went back to the pharmacy, the toothpaste is in the trash, and I'm off to check out both coconut and tea tree oils. Thanks to both Deelicious Sweets and mjskit! I also started using crest pro help about 1 month ago and sure enough I broke out with a perioral dermatitis. I also believe another culprit to this awful skin defect might have been my clarisonic mia. I had recently changed my brush head from sensitive to deep pore. I was given metro gel by my dermatologist and that didn't seem to help much, infactt when I finished The tube if metro gel my pd came back worse with a burning itching sensation that would keep me awake at night. I went on a few forums for PD and noticed many women talking about using Lanolin on their pd and it helping to clear it up and even cure it. I've been using the lanolin for two days now and I must say that it does help with the itching and constant burning and I swear many of the little bumps I had on my chin and around my upper lip are going away and my skin feels much less tight and dry. I will also try using coconut oil as well now since I see that it has helped so many women also. I also cleanse my skin nightly with just all natural yogurt and ground oatmeal powdered. It helps calm redness very well. Thank you for this lovely post! I have been suffering with my first batch of PD for about two months now. It took me about a month to self-diagnose since I've had pretty clear skin for 35 years and figured it was just a breakout at first. I've done a million things that seem to be working slowly but surely: ACV, greek yogurt masks, coconut oil... use castille or african black soap as needed (even as shampoo). I take evening primrose, probiotic and zinc tablets every day and put Episencial's Nurturing Balm (with Calendula and Zinc...) on my spots before going out. I avoid sunlight/sunscreen, and resist spicy foods and cinnamon (both of which I really like). I am now using a non-fluoride toothpaste but I did keep my previous tube around for my boyfriend since it was a new, full tube. After reading the different comments here about Crest Pro Health, I ran to my medicine cabinet... guess what I found? Crest Pro Health! I had just started using when I experienced my first symptoms. I'm so glad I hadn't thrown it out because now I know what set me off! Mjskit and, now, four others on this blog alone think it's the probable cause - it is probably not a coincidence. There must be others out there, most of whom fear it's some sort of yeast or hormone imbalance, not realizing it's just their stupid toothpaste! Crazy! What do we do about this? This product might not cause PD in everyone but should be taken off the market! So I'm struggling through a second round of PD, read all the comments regarding Crest Pro-Health...long story short I had switched toothpaste brands around the same time as this most recent flare up, you'll never guess what my new brand is, or wait, maybe you already have, yup, Crest Pro-Health!!! What gives??? Nature's Gate is both floride and sulfate free. Thanks for the awesome information! Will definitely try this out. Been suffering from PO since July of this year and it was under control, until when I was having a tummy bug, and vomited, my skin just got this crazy rash around my mouth. It made me feel really awful, would not want to have another episode of that. Is it possible to completely get rid of PO? I am 42 and experiencing my second po outbreak. I was diagnosed just after switching to Crest Pro Health toothpaste too! The first time I was treated with oral antibiotics for 3 months. This time I am trying dilluted organic apple cider vinegar applied topically twice a day. It seems to be working but very slowly. Avoid Crest Pri Health!!!! I have been dealing with PD for over about 10 years now off and on. The rash completely dissapiers in the summer but as soon as it gets cold it reappears. I have tried the antibiotics, sterioid creams and no SLS. I have the same issue. I was justst diagnosed with Pd. I am so upset. My diet is extrememly clean I do not use floride. I have used coconut oil for over a year and I am completely baffled. Tonight I tried the vinegar and tree tea mixture. Praying for a miracle. I guess I will have to do the antibiotics. Ugh. Being 55 and going to work without makeup and having acne and Pd is so embarrassing. Some one help!!!! (a health food store that has not SLS either) to finsh things off after I put on foundation. I have to write the brand names down so I can share them. It is taking some time but I am getting better. I just ordered Osmia Organics Black clay soap and plan to see how that works. It was formulated by an MD who has PD and she carries several other products that I will try to see if they help keep this at bay. I know they say wear no makeup while battling a PD outbreak, but that ain't gonna happen...if I have to out of the house, makeup is going on the face. So just use a really good moisturizer first! I know this is an older post but I still wanted to comment. I used coconut oil as a moisturizer for several months when I went green, and I LOVED it. However, I eventually developed periocular dermatitis (its essentially the same as perioral, but refers to the variety that appears around the eyes). It looked like I was wearing crazy red eyeshadow all around my eyes, and it spread to the skin on either side of my nose and above my upper lip too. I would also get tiny, puss-filled bumps and scaling, shedding skin. It was just terrible! I knew it wasn't life-threatening, but I still fell into a deep depression over it. I had ALREADY quit flouride, SLS, I wore "clean" makeup, used only natural cleansers (like honey) and coconut oil or sesame oil, my diet was very good... it just wasn't fair! I went to a derm who misdiagnosed me and put me on topical steriods. MISTAKE! What eventually worked for me was metrogel, but the dermatitis kept coming back when I tried to quit the medication. Finally I said "F this!" and quit my entire beauty regimen. I quit using makeup. I quit using cleansers. I even quit moisturizing with ANYTHING, including my beloved coconut oil. Guess what? My dermatitis was GONE within a couple of days. I just rinse my face once or twice a day with cool water. Thats it. This cured the dermatitis, but unfortunately I haven't found a solution for the mild dryness I've been experiencing. I have tried several times to use coconut oil to moisturize, but every time I get a few bumps around my eyes within 24 hours. I am going to experiment with some different oils to see if they all have the same effect. So far coconut oil and sesame oil both bring the bumps back, but they disappear again if I stick to water. My theory is that any moisturizer, natural or not, disrupts the natural balance of the skin. Humans didn't evolve to slather cold-pressed oils OR chemicals all over their face. Maybe we're simply not designed to mess with our faces so much. This is just my personal experience, but for me doing as little as possible to my delicate skin has been the solution. Quitting makeup was hard at first, but I got over it. You will too. And if this works for you, you won't need makeup anyways! I totally agree! Thank you for putting this out here. Quitting makeup will be tough but in the long run it would be worth it. I feel I need to thank everyone who has shared their stories because I believe it has helped me tremendously. I self-diagnosed myself with perioral dermatitis after several red, painful bumps appeared on my chin. They were embarassing and uncomfortable. After reading information from wonderful sights like this I quickly began a regimen that appears to be working. I stopped using all facial cleanser, moisturizers, toothpaste, etc. I created a mixture of organic pressed coconut oil (1 1/2 cups) and olive oil (1/2 Tbs.). I began washing my face with this 2 times/day. I also began using apple cider vinegar. I placed it on cottonball and held on affected sight for about 1-2 minutes. I also used organic yogurt as a mask every night. And after this I would place vitamin E and, aloe from my plant at home, and california baby's calendula cream. I also began drinking ACV, taking probiotics, vitamin E and turmeric. The rash became very red and flaky at first, but is now almost completely cleared. This only took me 4 days!!! I am so thankful for all of the information everyone has posted. I also forgot to mention that I mixed coconut oil, vitamin E and turmeric together and placed on rash one night while sleeping. I still have a little bit of redness, but bumps are gone and it appears to be going away. I also read online that pure violet extract will "cure" this terrible rash. I ordered mine online and will place on affected sight when it arrives. Good luck! Great article. I have learned a lot from your post. When it comes to coconut oil benefits, I really believe that it is effective. Been using it for so many years that's why I can attest to that. I just decided to tackle this issue on a natural level. Organic Greek yogurt maskes started a few days ago, cleansing only with water and Bragg's Apple Cider Vinegar. I ordered a Garden of Life probiotic and Organic Coconut Oil and am anxious to see some results. My question is what do I do wit the coconut oil to apply it?? I was not expecting it to be solid? Also, does anyone eat it straight up for the internal benefits or are you just cooking with it? The ACV & yogurt masks have made quite an improvement and the yogurt sooths the burning/itching effectivly. Ready for this to be gone!!! Makeup free is liberating!!!!! Hi - enjoyed reading all your insights. I've tried everything you all have tried without success. A friend took me to her nutritionist who ran some unusual tests. She feels there is an overgrowth of yeast in my system that is showing itself up on my face. She is recommending a detox, probiotics for getting the gut back on course - cleaned up - no sugar or grains or milk products. Just clean living - veggies, fruit, protein. She also said my body was not rested and a body needs rest to bid disease good bye. Stay tuned for hopeful results on this latest round. I am nervous about the coconut oil as I was advised by the derm to avoid anything that has oils. Did this really help? My case is quite severe at the moment and hugely distressing. Hello :) I have had PD for 7 years now. I have noticed alot of triggers. I cannot go tanning :( I cannot use dandruff shampoo as that kills the natural yeast on my face I think. I have to use a tea tree oil on my scalp for flakes. Works good. I cannot use liquid foundation. I have found that mineral makeup powder is amazing. I use it to absorb oils in skin and it actually helps. I can use any tooth paste, but cannot allow it out of my mouth. I have been on many antibiotic treatments (tetracycline) But I do not want to this time. I had a break out after tanning :( I tried tea tree oil on it, but it doesnt seem to help. I heard azelaic acid cures it, but have not tried it yet. I was wondering, does anyone know will I have this forever? I am 27. Ive had it for 7 years on and off and I want it gone for good so I can get a tan. I take birth control, should I get off the pill? I want this gone already! I have had this for 7 years as well - but am in my 60's and I would suggest that you get used to being a fair skinned beauty because heat, wind and UV rays make PD worse! Wear a hat and buy a tanning cream that doesn't require the sun to tan you. Make sure it is SLS free though! Caffeine (wherever you find it) as well as other foods can be triggers - (I have stopped eating anything with citric acid, citrus fruit, strawberries, cherries, chocolate, etc.) Cut things out of your diet one at a time for a few days or a week - then add them back in and see if you have a breakout. Sometimes it takes a few days for it to show up so don't do more than one at a time every couple of weeks. It is a pain, but it helps narrow down the culprits. I also cannot use salicylic acid or alcohol on my skin at all. I wash my face with ivory soap and use ponds face cream with the blue lid. My mom had the problem just around her nostrils and she cut out anything with citric acid, coffee, chocolate, etc. She was able to keep it away by doing that. I will have to try coconut oil. I found tea tree oil by the organic section of the grocery. Do you happen to know the brand you use? Do you ingest the same kind you moisturize with? I had positive results after all from tea tree oil. It burned lil at first but then cold & tingly. In 2 days my rash was gone. I cannot tan without gettting one :( Thats my #1 trigger! I am on a kinda holistic lifestyle right now & I know method cleaners use coconut oil in their all natural cleaning products. I am not prone to yeast infections or irregularity. Sounds like the bacteria and yeast in your body are not balanced. This can happen when you take an antibiotic. It kills good bacteria in your body that break down food, and give you extra yeast. Try eating yogurt or taking a probiotic from the health food store :) I get PD by my nostrils too. I notice it more when I have a cold & blow my nose alot. So, I try to blow my nose carefully and neatly. I hope one day this annoying bacteria in my body dies, and I can get tan again. Thank you so much for all your stories, iv been seen my doctor for years about this and he can never help me. Always giving me steroid creams. I will try everything here. I have been battling POD for almost two years. Was misdiagnosed by the first Dermatologist I saw...and mis-treated....with STEROIDS! My advice is to NEVER EVER EVER USE A STEROID CREAM, FOAM or otherwise on your face....for anything....EVER!! I am on TETRACYCLINE and METROGEL because my face literally went into STEROID WITHDRAWAL when I quit using it ( because my face had cleard up...vicous cycle). I do want to try Coconut Oil and/or something more natural and less harsh than the Metrocream.....but not sure how to go about it b/c I am so afraid of making it worse instead of better...which at this point would be hard because my entire face is now covered. POD is definitely HATEFUL!!! I am so jealous of those of you who have had results with coconut oil. I use organic extra virgin coconut oil daily on my face & body but I can't say I see any results from it. I just use it because it is natural. I am 36 & have Rheumatoid Arthritis & Lupus. This January I began to notice a bumpy red rash around my mouth & nose. I never had bad skin so having this happen at my age was very upsetting. Any time I have a new problem with my health I blame it on my autoimmune diseases. But I am wondering if this is triggered by hormones since I now have pimples on my chest & back all the time. As for natural products & being healthy I have to say I do it all. I have been a vegetarian for 23 years, I use Nature's Gate shampoo & conditioner SLS free, Jason (SLS free) seafresh toothpaste, Toms of Maine deodorant, Botanic makeup & I only wash my face with sunflower oil & castor oil. I don't understand why I have POD now but I can't control it. I take ACV pills, use Bragg's ACV with the mother as a toner when the POD is really bad & I take zinc daily as well as many other vitamins. One thing I have read about being an actual "cure" is Violet Extract. Since it is hard to find even at natural health food stores I purchased it online & am expecting my bottle this week. I am really hoping it is my answer since nothing else natural seems to work. If anyone has used Violet Extract I would love to hear from you. I am also interested in hearing what if any foods could trigger this. I find any mention about food playing a role in POD hard to find. I also have POD and Lupus. Was using products with SLS (crest pro health - imagine that! ), etc. But for those of you whose doctor has prescribed an oral antibiotic for POD, PLEASE BE AWARE that there are several that can cause something call DIL (Drug Induced Lupus). My last flareup was about 15 years ago, so when my joints started hurting and I started running a low grade fever, I knew something major had changed. Well, guess what? My dermatologist had prescribed an oral antibiotic called minocycline. I've been on it for 2 weeks. After some research and discovering the link to lupus, I quit taking it two days ago. I am now symptom free (of lupus symptoms) again. As much as I hate to say this, I much prefer my bumps to a lupus flareup! Thanks for all your insights. I am a 36-year old woman. I had POD twice before - a level 6/7 in college and level 10 outbreak in my early 20s which was horrendous. I just got it again after getting a small red rash next to my mouth. I'm sure I made it much worse by using hydrocortisone cream but I was thinking it was an allergy and forgetting the whole steroid-POD connection. I'd rate my current POD a level 5. It's currently on the left side of face and my chin. I also have a really healthy vegetarian died, avoid SLS (which ironically was in the Citaphel my dermatologist told me to clean my face with - not cool) and most sun exposure. I also have autoimmune problems which I'm seeing with a view people here (I have had blood diseases such as IEP, Hemolytic Anemia and developed arthritis in my early 20s). A connection? My skin is usually pretty good (although this year I have had more breakouts which is maybe hormones?) so this is not something I'm used to. I'm trying the coconut oil, ACV and Calendula. It doesn't seem to be getting better. I just got on Doxycycline Hyclate which I take for a month. My skin is so angry - it's burning and dry and I want to hide from the world. I just want this to go away and never come back! It's frustrating that after all these years they still don't seem to know anything about this condition. I feel that with conditions like this (along with autoimmune issues) that are faced mainly by women, there is little concern and research being done. Look into Osmia Organics formulated by an MD who also has PD. I am just getting started with her products but am hopeful that they will help. I used MEDERMA Advanced Scar Gel on my perioral and periocular dermatitis and it worked practically overnight. I've been perioral dermatitis-free for over a year now. I remember how maddening and painful this condition is and so I hope my recommendation helps someone else out there. Great insights about coconut oil! Happy that this blog seem to include the more mature age group, as we suffer from hormones etc. I use coconut oil all my life on my body and hair, but i do feel like it could be a bit too oily for the face.Its pore clogging and is rated high up for clogging pores.A great alternative is HEMP OIL. Another use for coconut oil I do is to put a chunk in my nouth and swish it for as long as i can. Spit it out, as it will be considered toxic. Brush with baking soda after. I just got a "wonderful gum" report from my dentist, for the first time in my life. I've been struggling with perioral dermatitis (POD) for about 4 months now. The only thing that really changed for me was that I moved to Europe just before the outbreak. I was still using all of the same products and make-up as before. I previously suffered from persistent acne (I'm 26, I shouldn't be dealing with acne anymore!) from having really oily skin. Right before I moved here, my dermatologist finally got me on a routine that was working for me (after years of trying all sorts of things): 100mg/day of spironolactone (a blood pressure medication, but it works also as an androgen (male hormone) blocker which makes skin produce less oil), topical Duac (Benzoyl peroxide/clindamycin) at night, Tretin-X (tretinoin) topical in the morning, and washing/moisturizing with Cetaphil cleanser and moisturizing cream. My skin was finally clear for the first time since I hit puberty, but as soon as I moved here - BAM! - perioral dermatitis. I read online that it can be caused by topical steroid use, and I didn't even realize that the tretinoin I was using was a steroid! I immediately stopped using it, I switched to fluoride-free toothpaste and stopped using everything with sodium laurel sulfate. I didn't want to use antibiotics (usual treatment from doctors), so I tried everything else I could think of first. I spent months searching online, and I finally found some info about zinc deficiency in relation to skin conditions like POD and acne. I did some research on zinc deficiency, and I actually had a few of the other symptoms (aside from the dermatitis). I went out and bought some zinc supplements, and started them immediately. Now it is only 2 days later, and my POD is almost completely gone! I'm not a religious person, but this feels like a miracle. I have been miserable from this for so long, I finally feel normal today! I don't know why zinc deficiency isn't a commonly accepted cause of POD. If you are suffering from POD, you might want to ask your doctor to test your zinc and also iron levels. (Iron deficiency can also be related to POD.) I never post things like this online, but there is just so little info out there about this, that I had to share my story! Thank you for this post! I cannot wait to use the coconut oil on my face! I have suffered from POD since i was 16 (10 years). I have memories of being a teenager begging my mom to call me in sick to school because i was so humiliated of my mouth. The sores were so bad they were yellow and the sores would grow over other sores so it looked like mounds of scabs. Not to mention its PAINFUL. I went years without knowing what it was because I never went to a dermatologist. I went to regular doctors and many of them told me it was staph infection. WRONG. I use Carols Daughter sulfate free shampoo and I use Sensodyne Pronamel toothpaste which actually has no SLS in it believe it or not. It took me years to find just the right products that work for me. POD is a life long battle. It doesn't just "go away I went 2 years without having anything and bam! I wake up and its there full force. I wanted to get my story out there and the products I use hoping to possible help someone with the same issues. I also wanted to mention that I ALWAYS seem to get a POD breakout when I use Chapstick brand chapstick. I have not decided if this is coincidence or if Chapstick is a trigger! Please keep this in mind. Thanks again for your post! It's so frustrating! Just make sure to switch to all natural products for your face!! I love Osmia Organics Black Clay Soap. Also, you can try Avene Thermal Spring Water (I just started using it and it's a God send). I was diagnosed about two weeks ago. I did the zero therapy (water only) for a week and cleared up tremendously! Went for a dentist appt and he suggested staying away from fluoride and do a coconut oil with baking soda toothpaste instead (and floss daily) and that should help. Can you ck in and let us know how it's doing, now pls? Did it heal?If so, what did it? After reading this page ive just found out i have got PD. I have had it around 3 months, been thinking it was just eczema tho. Its burning and red and lumpy, horrible! Been using Betnovate on it, makes it go then it returns worse!!! I will be using just natural from now on. This is all brilliant information! I am 26, i have always had bad skin but it was about 6months ago I had THE worst outbreak of POD I have ever experienced. I went through a very stressful time and I put the outbreak down to this, but 6months later my life is pretty brilliant now, no stress, yet I still wake up wanting to cry at how bad my face looks. It looks and feels so sore, it stings and itches all day and I am constantly aware it is there, I always have that 'are they looking at it?' feeling whenever I talk to anyone! I have been to the doctors, like most of you, so many times and been told to try this cream, this antibiotic, this gel etc.. nothing has worked. The latest thing my doctor has told me to do is cha ge my contraceptive pill, as I had just started a new cycle with my old pill I need to wait a few weeks to start the new one..
Not sure how confident I am though as my GP always talks about 'acne', I try to explain that what I have on my face is not acne but he is always prescribing things for acne. So I will try this new contraception anyways and if no improvements after a few months my GP will refer me to a dermatologist after years of me asking! Cocunut oil, greek yoghurt, aveeno products.. avoiding these sulphar using products. I am going to try it all thanks to everyones comments here. The only thing I am not happy to try is to not wear makeup.. i have always been a self conscious person and the idea of house bare skinned, POD in full swing, red and raw, terrifies me! I will give any updates if I find anything that has worked. Of all the creams, lotions and potions I have tried so far I have found good old Sudacrem to be the best, not cleared it but I would normally apply at night and it would calm it down and sooth it a little. Time now to try some natural things. We are not alone are we girls! Can't wait to try these suggestions when I get home and see what kind of toothpaste I am using!!! I am 37 and refuse to go back to derm office b/c they never help. For my sensitive skin I had reactions and found out I was allergic the ingredients in Mederma. But after all the testing and trying out different scar creams, the Dr. max Powers Scar Serum - I was able to handle and actually helped and made a lot of my old and new scars disappear. It's affordable and its easy to use and safe. Luckily I haven't had any bad reactions with the Dr. Max Powers Scar Serum and for a person with super sensitive skin that's amazing and want to jump for joy. I discovered I had POD about a month and a half after it first appeared. Around the time I began breaking out, I had come down with a cold that I still have to this day. My theories as to how it started stem from my recent move to Germany, the hard water, toothpaste (colgate), Redken shampoo and conditioner, my cold that I came down with at the same time and I also began using coconut oil around my eyes and nose around the same time as well. I have the bumps mainly around my nose and underneath my eye, which is ironic because this is where I placed my coconut oil when I first began using it. A month and half later, I am back in the states, I was 100% convinced that it was the hard water in Germany so I was looking forward to coming home to softer water and a clearer face. Well sure enough a week later and the redness and bumps are still here. That is when I realized something was not right with my skin. I visited my family doctor and he has prescribed my to an anti-biotic and Mucinex D (to help with my cold) at this point I plan on avoiding the anti-biotic at all costs, thanks to everyone's testimonies. For two days now I have done zero treatment beside regular face wash) and I have began to notice reduced redness. I think a number of factors may have contributed to this: using baking soda instead of crest toothpaste, my shampoo, conditioner and face washes are SLS free, coconut oil and softer water than Germany. Tonight I put on a little bit of coconut oil and plan on evaluating my skin in the morning. From my research it seems that zero treatment seems to be the most successful way to eliminate this awful awful skin problem. I intend of sticking to that with no make-up and no lotions and lots of tea! I am moving back to Germany here in a few days so I plan on stocking up on back up treatments such as the pure violet extract and possibly the scar gel. Praying that a miracle happens and I will be relieved from this depressing skin problem. I pray for all of those who are also suffering with POD. IT'S A FACIAL YEAST INFECTION. After a decade of dealing with this annoying and embarrassing condition, I finally discovered a treatment that works. I'm guessing most people have realized after having it for a long time that there're dietary triggers that cause PD. For the majority of people, they'll piece it together that refined carbohydrates, and especially sugary foods, cause flare ups. The reason this is, is because particles fall below your mouth and collect while eating, or get smeared on your face (if you're using a sugar scrub, stop now), and yeast begin to collect and colonize and feed off off the sugars and starches. It's an overgrowth of yeast on your face, which is why the symptoms are identical to athlete's foot, jock itch, and vaginal yeast infection, just on a different part of your body. This is probably also why it disproportionately affects women, especially middle-aged women, than it does men or young females. Get yourself a good topical OTC anti-fungal. I've heard any that contain butenafine hydrochloride (lotramin for athlete's foot) work well. I already had ketoconazole in my medicine cabinet and, after dealing with a nasty outbreak the past two months, tried it last night, and it's nearly gone a day later. This is why people's attempts at homemade treatments work with partial success - coconut oil, tea tree oil, zinc and zinc oxide, etc all have natural anti-microbial and anti-fungal properties. But they're not strong enough. I was thinking about trying an AF cream. The one you mentioned with that ingredient isn't available anymore... I'm going to buy some daktarin cream, which is micinazole 2%. I'm just worried that it might make things worse !! If that's possible at the moment. I eat all the right things, check all the bad ingredients on labels and read every blog going!! I am currently using nothing but water, I've got some coconut oil to try,it can't look much worse, it's dry, crusty, bright red and sore.. Thanks for the info.. I'll give it a try in a couple of days. I accept coconut is the one of the best makeup ingredient. I did a lot of these things too. It was really bad. I tried cortisone, vinegar, antibiotics, antifungals, zinc, tea tree oils, and treatments for demodex mites (i would try anything!). The vinegar seemed to help a little, but then my skin felt pretty raw. Then i really started thinking about it. It clearly seems like some kind of skin biome malfunction- otherwise why would doctors usually prescribe antibiotics and antifungals, and those treatments help people... seemingly mostly temporarily. The only way to really improve things is with a probiotic. You can fight the bad stuff all you want but if you don't seed your skin with good bacteria the bad will just keep coming back. Which I think is where the unfiltered vinegar and yogurts come in. But those could introduce a lot of potentially bad biotics too... I read about studies where people with good skin were found to have a certain bacteria in higher concentrations than people with bad or reactive skin. So i searched and tried the simplest probiotic i found (literally only probiotic and water). The instructions are to use NOTHING else, and it was hard, but my skin started calming. I REAALLLYYY recommend it. I don't have my before and afters on me but maybe i'll get those together soon. It feels like a miracle. anyway I think there are some different probiotics out there but I would avoid the ones mixed with various lotions and oils (they were also more expensive too anyway). It would be too hard to figure out which ingredient helped or not. This one is called Probiotic Action, and it's only $13.95. I wouldn't recommend the cleanser they sell, although it's cheap, it has sulfates which can be irritating. It took a couple weeks for it to really settle down, and now i'm just maintaining and hoping some of the scarring will improve! AFTER 6 LONG YEARS, I HAVE FINALLY FOUND A CURE FOR MY PD!!!! :) :) Up until 2 weeks ago I had perioral dermatitis around my eyes, nose and mouth. I'll admit i'm a teeny bit vain so having this unsightly rash on my face caused me a lot of depression and anxiety. After being given anti-fungal and steroid creams from the doctor which only made it worse, would spend most evenings searching the internet looking for natural cures for PD and trying everything and anything. From fancy diets, candida detoxes, homeopathy and expensive blood tests with high end nutritionists I came to the realisation that I was going to have to live with it forever. Well, that was until I visited an Ayurvedic Doctor. She did a full health check on me and gave me a small pot of herbal powder. I was told to take half a teaspoon in warm water twice a day, half an hour before meals. It is very bitter tasting but soooo worth it! Two weeks later, my skin is beautiful!!! It looks incredibly perfect. It feels surreal to have lived with the rash for so long and now it's completely gone. From what I understand, she mixed several bitter tasting herbs together that act as a powerful blood purifier. I live in the UK and googled Ayurvedic doctors. I'm sure they exist in America too. Good luck! Thankful for this blog!! Started showing symptoms of this 4 months ago, family doctor prescribed steroid cream which I found out today made things worse!! Finally got into a dermatologist and she knew right away what this was. Coconut oil is too natural and will penetration the skin and irritate further over time. All natural is not always better! This is what she said! I am now on 8 weeks of antibiotics (1 pill a day) and cream of noritate Cr. 1% and erythrocyte 1% mixed by the pharmacy. Now I have to wait another 3 weeks to see results. I was going insane trying elimination diets trying to cure eczema that I never had! Funny because in my 27 years I never had eczema so I was wondering how it came along all the sudden. Little red bumps and dry skin, which is mostly on my neck but also around my nose. I hope others find this blog before they try steroid creams! Perioral dermatitis is easily misdiagnosed as eczema and it's the worst misdiagnosis you could get.